Inquire: What Caused the Growing Conflict and Sectionalism in the 1850s? By 1852, America’s great compromise politicians were gone. Henry Clay, Daniel Webster, and John C. Calhoun — three almost-larger-than-life men who had managed to hold the Union together for 40 years had all died. Without their stabilizing influence and in a world of mounting opposition to slavery and a South unwilling to change, the escalation of tensions and conflict was inevitable. The Fugitive Slave Act, one part of the Compromise of 1850 that held the Union together, was now a major issue in what was tearing it apart. As the North and the South became more entrenched in their sectional positions, what had once seemed inconceivable was becoming a reality — either separation or war. A satire on the antagonism between Northern abolitionists on the one hand, and Secretary of State Daniel Webster and other supporters of the Fugitive Slave Act of 1850. What impact did the Fugitive Slave Act have on the growing sectionalism and conflicts in the United States? Read: The Fugitive Slave Act - The Law or Morality? The hope that the Compromise of 1850 would resolve the sectional crisis proved short-lived when the Fugitive Slave Act turned into a major source of conflict. The federal law imposed heavy fines and prison sentences on Northerners and Midwesterners who aided runaway slaves or refused to join posses to catch fugitives. Many Northerners felt the law forced them to act as slave-catchers against their will; obey the law or obey morality. warned that any black person, free or slave, risked kidnapping by slave-catchers. The law also established a new group of federal commissioners who would decide the fate of fugitives brought before them. In some instances, slave-catchers even brought in free Northern blacks, prompting abolitionist societies to step up their efforts to prevent kidnappings. The commissioners had a financial incentive to send fugitives and free blacks to the slaveholding South, since they received ten dollars for every African American sent to the South and only five if they decided the person who came before them was actually free. The commissioners used no juries, and the alleged runaways could not testify in their own defense. The operation of the law further alarmed Northerners and confirmed for many the existence of a “Slave Power” — that is, a minority of elite slaveholders who wielded a disproportionate amount of power over the federal government, shaping domestic and foreign policies to suit their interests. Despite Southerners’ repeated insistence on states’ rights, the Fugitive Slave Act showed that slaveholders were willing to use the power of the federal government to bend people in other states to their will. While rejecting the use of federal power to restrict the expansion of slavery, proslavery Southerners turned to the federal government to protect and promote the institution of slavery. The actual number of runaway slaves who were not captured within a year of escaping remained very low, perhaps no more than 1,000 per year in the early 1850s. Most stayed in the South, hiding in plain sight among free blacks in urban areas. Nonetheless, Southerners feared the influence of a vast Underground Railroad, the network of Northern whites and free blacks who sympathized with runaway slaves and provided safe houses and safe passage from the South. Quakers, who had long been troubled by slavery, were especially active in this network. It is unclear how many slaves escaped through the Underground Railroad, but historians believe that between 50,000 and 100,000 slaves used the network in their bids for freedom. Meanwhile, the 1850 Fugitive Slave Act greatly increased the perils of being captured. For many thousands of fugitives, escaping the United States completely by going to southern Ontario, Canada, where slavery had been abolished, offered the best chance of a better life beyond the reach of slaveholders. Harriet Tubman, one of the thousands of slaves who made their escape through the Underground Railroad, distinguished herself for her efforts in helping other enslaved men and women escape. Born a slave in Maryland around 1822, Tubman, who suffered greatly under slavery but found solace in Christianity, made her escape in the late 1840s. She returned to the South more than a dozen times to lead other slaves, including her family and friends, along the Underground Railroad to freedom. The Fugitive Slave Act provoked widespread reactions in the North. Some abolitionists, such as Frederick Douglass, believed that standing up against the law necessitated violence. 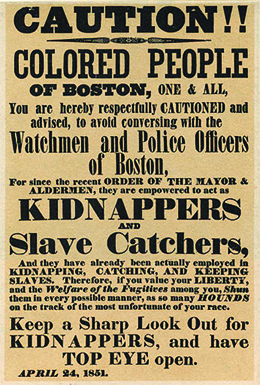 In Boston and elsewhere, abolitionists tried to protect fugitives from federal authorities. One case involved Anthony Burns, who had escaped slavery in Virginia in 1853 and made his way to Boston. When federal officials arrested Burns in 1854, abolitionists staged a series of mass demonstrations and a confrontation at the courthouse. Despite their best efforts, however, Burns was returned to Virginia when President Franklin Pierce deployed federal troops to support the Fugitive Slave Act. Boston abolitionists eventually bought Burns’ freedom. For many Northerners, however, the Burns incident, combined with Pierce’s response, only amplified their sense of a conspiracy of Southern power. The most consequential reaction against the Fugitive Slave Act came in the form of a novel, Uncle Tom’s Cabin. In it, author Harriet Beecher Stowe, born in Connecticut, made use of slaves’ stories she had heard firsthand after marrying and moving to Ohio, then on the country’s western frontier. Her novel first appeared as a series of stories in a Free-Soil newspaper, the National Era, in 1851 and was published as a book the following year. Stowe told the tale of slaves who were sold by their Kentucky master. While Uncle Tom is indeed sold down the river, young Eliza escapes with her baby. The story highlighted the idea that slavery was a sin because it destroyed families, ripping children from their parents and husbands and wives from one another. Stowe also emphasized the ways in which slavery corrupted white citizens. The cruelty of some of the novel’s white slaveholders (who genuinely believe that slaves don’t feel things the way white people do) and the brutality of the slave dealer Simon Legree, who beats slaves and sexually exploits a slave woman, demonstrate the dehumanizing effect of the institution even on those who benefit from it. Stowe’s novel proved a bestseller and was the most-read novel of the 19th century, inspiring multiple theatrical productions and musical compositions. It was translated into 60 languages and remains in print to this day. Its message about the evils of slavery helped convince many Northerners of the righteousness of the cause of abolition. The novel also demonstrated the power of women to shape public opinion. Stowe and other American women believed they had a moral obligation to mold the conscience of the United States, even though they could not vote. The backlash against the Fugitive Slave Act, fueled by Uncle Tom’s Cabin and well-publicized cases like that of Anthony Burns, also found expression in personal liberty laws passed by eight Northern state legislatures. These laws emphasized that the state would provide legal protection to anyone arrested as a fugitive slave, including the right to trial by jury. The personal liberty laws stood as a clear-cut example of the North’s use of states’ rights in opposition to federal power while providing further evidence to Southerners that Northerners had no respect for the Fugitive Slave Act or slaveholders’ property rights. If you were faced with a law like the Fugitive Slave Act that required you to either violate the law or violate your personal moralities, which would you choose to violate, the law or you personal moralities? Antebellum America seethed with sectionalism — the North vs. the South — and in the early to mid-1850s, the conflict and opposition between the two sections was approaching a tipping point. The pressure had been building among Northerners to organize the territory west of Missouri and Iowa, which had been admitted to the Union as a free state in 1846. This pressure came primarily from Northern farmers who wanted the federal government to survey the land and put it up for sale. Promoters of a transcontinental railroad were also pushing for this westward expansion. Their theory was that this land would be free, non-slave, as per terms of the Missouri Compromise of 1820, and the Wilmot Proviso, which had provided that there would be no slaves in the territory acquired in the Mexican-American War. Southerners, however, had long opposed the Wilmot Proviso’s stipulation that slavery should not expand into the West. By the 1850s, many in the South were also growing resentful of the Missouri Compromise of 1820, which established the 36°30′ parallel as the geographical boundary of slavery on the north-south axis. Proslavery Southerners contended that popular sovereignty should apply to all territories, not just Utah and New Mexico. They argued for the right to bring their slave property wherever they chose. In the 1850s, attitudes toward slavery fueled the sectionalism. Throughout the South, slaveholders entrenched themselves in defense of their “way of life,” which depended on the ownership of slaves. Since the 1830s, abolitionists, led by journalist and reformer William Lloyd Garrison, had cast slavery as a national sin and called for its immediate end. For three decades, the abolitionists remained a minority, but they had a significant effect on American society by bringing the evils of slavery into the public consciousness. By the 1850s, some abolitionists advocated the use of violence against those who owned slaves. In 1840, the Liberty Party was founded; its members came from the ranks of ministers. This group sought to work within the existing political system, a strategy Garrison and others rejected. Meanwhile, the Free-Soil Party committed itself to ensuring that white laborers would find work in newly acquired territories and not have to compete with unpaid slaves. It is important to note that, even among those who opposed the expansion of slavery in the West, very different attitudes toward slavery existed. Some antislavery Northerners wanted the West to be the best country for poor whites to go and seek opportunity. They did not want white workers to have to compete with slave labor, a contest that they believed demeaned white labor. Radical abolitionists, in contrast, envisioned the end of all slavery and the emergence of a society of equality between blacks and whites. Others opposed slavery in principle, but believed that the best approach was freed slave colonization, that is, settling freed slaves in a colony in Africa. The growing political movement to address the issue of slavery stiffened the resolve of Southern slaveholders to defend themselves and their society at all costs. Prohibiting slavery’s expansion, they argued, ran counter to basic American property rights. As abolitionists fanned the flames of antislavery sentiment, Southerners solidified their defense of their enormous investment in human chattel. Across the country, people of all political stripes worried that the nation’s arguments would cause irreparable rifts in the country — a fear that proved to be a prophecy fulfilled. Slave Power was the influence of freed slaves over the federal government to shape domestic and foreign policies. _____________ was the network of northern whites and free blacks who sympathized with runaway slaves and provided safe houses and safe passage from the South. Uncle Tom’s Cabin was a consequence of the Fugitive Slave Act. Who is William Lloyd Garrison?